Red bean curd is used in Chinese cooking as a condiment. It is a type of preserved bean curd (also called fermented bean curd), that consists of cubes of soybean curd that have been preserved in rice wine, fermented red rice, and other seasonings. In addition to the red, there are several varieties of preserved bean curd, from white (which is basically plain fermented bean curd) to stinky, which is fermented over six months, to Chiang bean curd that is soaked in miso. Sometimes called "Chinese cheese," fermented bean curd has a similar mouthfeel to certain dairy products. The fermentation breaks down the proteins giving the bean curd a texture like a smooth paste. Because the soybean curd is very mild on its own, it takes on the flavors that are used during the fermentation—or brining—process. The result is mellow and sweet but will also often have a strong smell and taste of alcohol. Red bean curd is the basic white bean curd with an added ingredient that turns the mixture red. Like all bean curds, the soybean curd is first dried (air-dried or by a chemical process) and then added to a brine of rice wine and other seasonings. 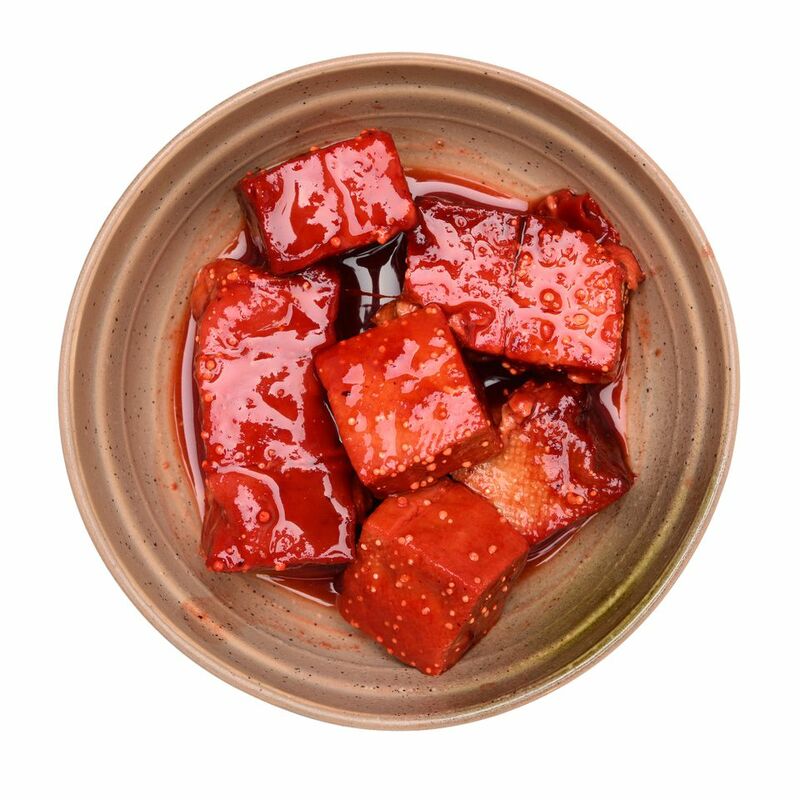 To make red bean curd, a fermented rice that is a bright red-purple in color, called red yeast rice, is combined with the brining liquid creating not only the red color but also a distinct aroma and flavor. Some recipes will contain chili, adding to the red hue and offering a bit more zing. In the mainland of China, you can purchase fresh bean curd, but elsewhere it is sold in commercially packaged jars that contain small blocks of the bean curd. In the U.S. you can find the jars in Chinese markets. A popular brand is Fu-Chung, which contains quite a bit of sauce in the jar along with the cubes. Refrigerated, bean curd can be kept for a very long time—several years, in fact. There is a version of red bean curd sold that is similar but has other ingredients added. It looks like ketchup and contains, sugar, rose wine, and caramel. In Chinese cooking, a small amount of fermented bean curd is used to add flavor to everything from rice and congee to vegetable stir-fries and braised dishes. It is also combined into sauces that go alongside a hot pot. When eaten with a dish like porridge, it is not mixed in directly; instead, a chunk of the brick is broken off and then eaten along with a spoonful of the rice dish. Because of the fermentation, red bean curd is often used to marinate beef and poultry as the alcohol-quality will help tenderize the meat before it is slow cooked or deep fried. Red bean curd actually has a more subtle flavor than the plain white, which can be very salty and has a more pronounced flavor, and therefore is added to many dishes without drastically changing the flavor.